I spent most of last week running around with this book tucked awkwardly into my purse. I confess that I don't usually read hardcover books because I find them cumbersome to hold and read on the train, but I made an exception this time because the story looked so good. It's called Finding Betty Crocker by Susan Marks, and it tells the history of the iconic domestic spokeswoman from inception (or rather, invention) to the present day. The book is a couple years old (2008, I believe), but I picked it up in my hunger to learn more about mid-century housekeeping and was not disappointed. 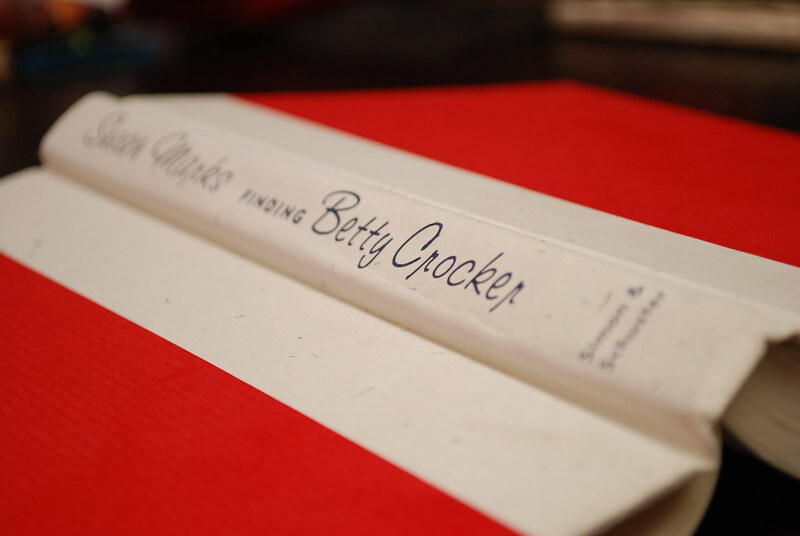 I absolutely loved reading about the incredible influence and inspiration that Betty Crocker was for women in the early and mid twentieth century, particular during the trying economic times of the Great Depression, and then later in the 1940s when women had to relearn how to manage a household during times of extreme rationing and trying personal challenges (working outside of the home, dealing with the absence--and sometimes death--of men serving in World War II). Today we associate Betty Crocker with the ubiquitous red spoon logo on the packages of supermarket cake mix, but it was interesting to learn that this is not at all how Betty started. For many years--decades, even!--Betty Crocker was the woman who calmed and instructed inexperienced young brides and inspired frustrated older women stuck in a rut. Through her incredibly popular radio shows (click here to listen to an mp3 of one of these wartime Betty Crocker radio programs), tv appearances, booklets, personal letters (each researched and handwritten by one of a veritable army of college-educated home economists employed by General Mills), and bestselling cookbooks, she taught women about nutrition, budgeting, housekeeping, and cooking. She even, on occasion, offered advice on matters of the heart! 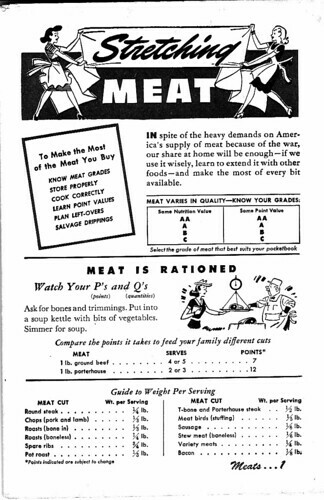 While Betty's advice was very much a service to her audience, her sales agenda was never lost from the message; every single one of her recipes and tips made use of major General Mills products like Bisquick, Wheaties, and Gold Medal Flour. The implication was always that to use anything but the "tested and assured" General Mills products, was simply opening oneself up to failure and waste--a pointedly suggestive argument in times of economic hardship. I will buy carefully. I will take good care of the things I have. I will waste nothing. 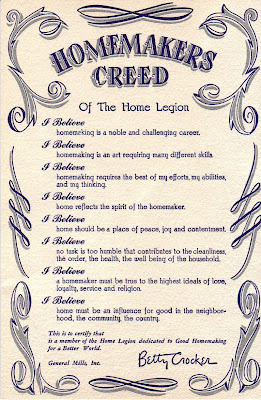 At the time, this pledge was a patriotic duty during wartime, but they're simple words that hold true and are just as relevant today. As someone who is trying to find a way to reduce waste in my kitchen, I like knowing that this is something that has been important to generations of women before me. As I've mentioned in the past, I'm really trying to focus this year on building an developing my personal brand in order to create a solid foundation for my future projects. From this perspective, I found the branding lessons in this book incredibly enlightening. Through initiatives like the Home Legion, Betty (and by extension, General Mills) created a sense of brand loyalty and connection that is remarkable both from a history and a marketing perspective. The connection between the consumers and Betty Crocker was so strong, that many were devastated when they finally learned that she was not a real person. The General Mills headquarters, which offered tours of the "Betty Crocker kitchens" to curious tourists and fans, were even equipped with sympathy hosts and tissues to console the women who learned they would never be able to meet Betty in person. In the book, one of the home economists from the test kitchens compared the realization to finding out there is no Santa Claus, but called it "worse because Betty was their hero." Near the end of the book, the persona of Betty Crocker started to lose her relevancy and underwent a bit of a personality crisis. She was challenged by feminists and radical groups who found her "offensive." The women's group NOW even filed a lawsuit against General Mills because they found Betty "discriminatory toward minority women" simply because she was white. Critics defended Betty, of course, and the suit was eventually dismissed, but it was evident of a distinct change in society. One thing I found most significant, was the way the official Betty Crocker portrait, which during the 40s and 50s had remained a solid and classic image, started receiving multiple "reconstructions" to better fit the fashion and sensibilities of the time. She quickly went from being a warm and motherly icon, to a young and polished woman who looked like she barely ever stepped foot in the kitchen. In 1996, perhaps as an answer to those miffed by her "whiteness"; yet another new portrait was created consisting of a computerized composite of 75 different women of different ethnicities and ages. 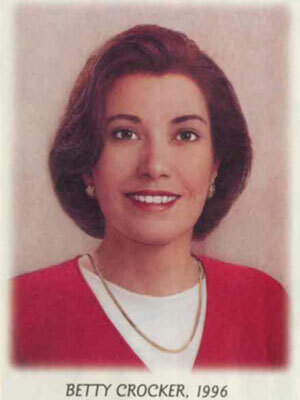 The result (seen above) is a bit of an odd news anchor/political wife style woman with slightly tan skin, freakishly white teeth, and a perpetually dazed expression. It's probably the reason why the Betty Crocker image has disappeared from most packages, and has since been replaced by the easily recognizable (although much less charming) red spoon logo. Her story lives on in this book which combines history and social marketing in an entertaining and totally readable format. I definitely recommend it, and if you are hungry for a bit of vintage Betty, do a search online for some of her classic pamphlets and cookbooks from the 40s and 50s. There are a lot out there and they're really a great way to absorb some of the incredible history of kitchens past. I'd love your recommendations for some great food-related books (both fiction and non-fiction). I'm especially interested in those that have to do with wartime and mid-century cooking and housekeeping. Let me know if you have read some good ones! I liked your book review... I'll be picking this one up soon! I love this book and I know the author personally, Susan an amazing talent!! That's so great, Jennifer! I really LOVED this book and enjoyed reading it. 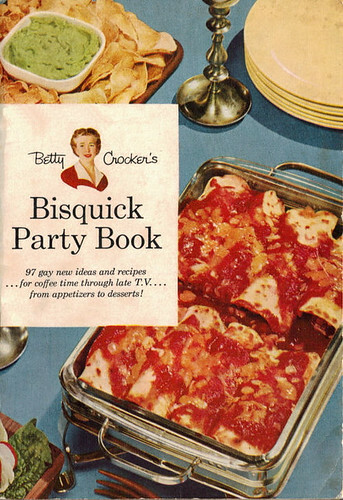 Betty Crocker's take on La Comida Mexicana in that Bisquick Party Book photo looks interesting. Are those potato chips with the guacamole?! Regarding Betty's "whiteness" - people find anything and everything offensive! I do have to say that the '96 version is very Madame Tussaud's - pretty dead in the eyes. Thanks for sharing! I'm trying to read more food books lately. I really love Judith Ryan Hendricks' "Bread Alone," which is fiction — about a woman learning to bake bread while she deals with her divorce. Not the greatest plot summary, but I thought it was great! This is a great review and I have added this to my to-be-read list. Thanks! There is also one that you might find interesting, that has less to do with food and is a bit dated but still interesting and that is More Work For Mother: the Ironies of Household Technology from the Open Hearth to the Microwave by Ruth Schwartz Cowen. I have only read excerpts of it, but it is a fascinating history, both of the technology and the social norms of household chores. How interesting! This was a fascinating review. I had no idea she had that much of an influence on American cooking--I want to read the book now! I second the Ruth Reichl books comment--her books were so interesting and juicy. I have 'Never Eat Your Heart Out,' by Judith Moore, but haven't started it yet. My favorites, though, are 'A Year in Provence' and the sequels (though none are anywhere near as great as that first one) by Peter Mayle. "For more than a dozen years before World War II, the Chamberlain family lived and learned to eat in the tiny cathedral town of Senlis, France. Their Burgundian cook, Clémentine, presided over their kitchen in France, and later in Marblehead, Massachusetts. The alert, good-natured cuisinère is the heroine of Clémentine in the Kitchen, first published in 1943 and happily reissued in the Modern Library Food series. The book is a gem: part gastronomic diary and part cookbook (over 170 recipes are included), it also evokes, perhaps most interestingly, Clémentine's affect on a small town in pre-"gourmet" America, and its influence on her." I love scouring second hand bookshops and finding little gems.. Thank you for such a thoughtful review of my book! I really enjoy your site!